Brandon Chen and Kelly Phil broke the record by being the very first international team to break in the most difficult, most prestigious policy debate event. High school policy is extremely challenging because there is no limit to Affirmative topic choice, and because only the winners are allowed to attend. Worldwide, only 3% of debaters who won in their local district, specifically top 2 teams from each of the approximately 200 NSDA districts are permitted to attend the annual NSDA Nationals. This year, approximately 180 policy teams qualified. 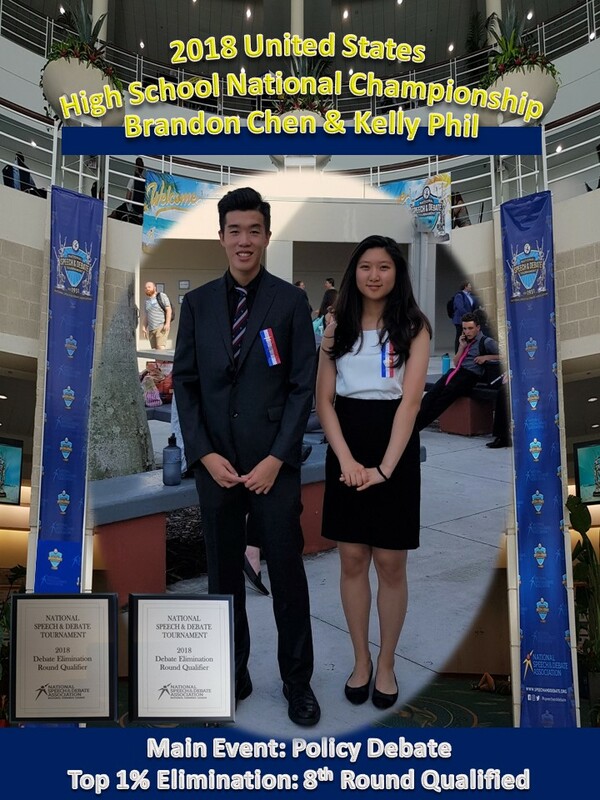 By winning the 1st place from last April NSDA Taiwan, Brandon/Kelly qualified, and made it to the first break of approximately 60 teams by winning 4 rounds out of 6 preliminary rounds, and advanced to receive 2 more ballots in round 7 and 8 each, which would place them close to top 50 out of 180 teams, representing the top 1% of policy debaters worldwide, certainty not only the very best policy debaters in Taiwan, but even in the U.S.!! McKenzie Engen and Darren Fang proved once more that in International division, ADL debaters dominate by easily winning Japan, Korea, and China teams. Jonathan Hsu, Salina Kuo, and Angela Wang represented Taiwan in one of the NSDA main events, the World School Debate. WSD is difficult because the topic changes every single round. With two preliminary wins, albeit they didn’t break in the main event, they did in the supplementary event called “Extemporaneous Debate.” Jonathan and Salina both broke to the first elimination round! As a perfect closure, our middle school debaters – Amber Ting and Andrew Tsang made Taiwan #1 by being #1. In preliminary rounds, Nathan Sung and Micah Wang were higher seed than Amber/Andrew due to their higher speaker points, testifying how close they could have won first place, and proudly demonstrating their mighty power and potential to win any opponents even in the U.S. Categories: Accomplishments, Awards, Featured, Newsletter, NSDA U.S.